What an amazing year for cosplay! Hot dam,n you are all so talented and clever and creative it almost makes us mad. But we love you and all the great cosplay we saw this year. So as a tribute, here is a collection of our favorite cosplay moments from 2014. They Live Wonder Woman, photo by Victor Gamez. Spotted at SDCC. Edge of Tomorrow suit, Getty Images photo by Daniel Zuchnik. Spotted at NYCC. Labyrinth Family doing Little Shop of Horrors. Image from the Deconstructress Designs Facebook page (where the family sells rad costumes). Via Halloween roundup. The insanely talented Phi Phi O'Hara's four amazing costumes for Halloween 2014. Left to right: Pizzazz from the Misfits, Greta Gremlin, Yzma, and Lydia Deets. Via Halloween roundup. UPDATE: MODOK (sorry!) via Getty Images. Spotted at SDCC. Mojo Jojo, Flickr image by Steven Leung. Spotted at NYCC. Demona, photo by Dave Nelson. Spotted at Dragon Con Masquerade. HAL by commenter SeanHurlburt. 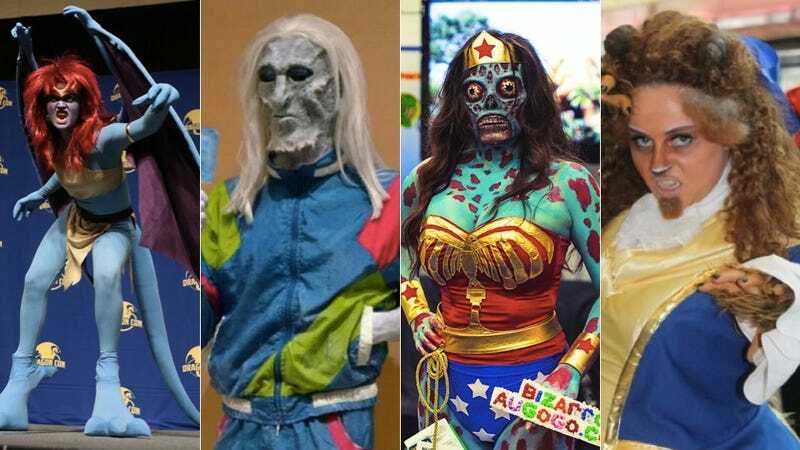 Via io9 Halloween Costume show! Choose Wisely on your Last Crusade. Photos by Mooshuu. Spotted at SDCC. Apocalypse, p hoto by Mooshuu. Spotted at SDCC. Every Johnny Depp, Getty Images photo by Daniel Zuchnik . Spotted at NYCC. An impressive Professor Hubert J. Farnsworth created by Frank Ippolito, via tested.com and frankippolito.com. Via Halloween roundup. Baby Rufio! Spotted at SDCC. The most Batpeople ever in one spot. These folks from Calgary won the Guinness World Record for "Largest Gathering of People Dressed as Batman." Photograph from Jordan Hoffman. Spotted at Star Trek Las Vegas. Bumblebee,photo by Undiscovered Photography/Seattle Geeky Girls. Sick Jack Nicholson Joker, via Davann Srey Photo on Flickr. Spotted at Long Beach Comic-Con. Battle-Ready Wonder Woman, Flickr image by Richie S. Spotted at NYCC. '80s Game of Thrones IRL! Inspired by Moshi Studio's Game of Thrones art, recreated in real life by Kuiosikle Industries and Ginger Lamb Photography. Spotted at Dragon Con. Walking Nightmare Cheshire Cat, created by Articus12. Via Halloween roundup. Gravity Falls' Bill Cipher, Getty Images photo by Daniel Zuchnik. Spotted at NYCC. Ronald McThor, photo by Graymalfa416 via Dorkly. LEGO Avengers, Flickr image by Steven Leung. Spotted at NYCC. Batman: The Animated Series Cosplay, photo by Erik Estrada. Spotted At SDCC 2014. Captain Eo, from Davann Srey Photo on Flickr. Spotted at Long Beach Comic-Con. Dwarf Women, spotted at SDCC. Steven Universe's Opal, photo by Meredith Woerner. Spotted at NYCC. DS-9 and Wormhole, photograph by Jordan Hoffman. Spotted at Star Trek Las Vegas. Face Mask. Created by Sandra Holmbom. Rogers Crossing the Delaware. From the design, costuming, videography, and marketing service Contagious Media. Original photo by Pat Loika. Lady Death Star rocks a 20-pound dress. Damn. Photographed by Jessie and Courtney at Undiscovered Photography. Spotted at Edmonton Expo. Garrosh! Spotted at BlizzCon 2014 Costume Contest via Wowhead News. Beauty AND the Beast in ONE! Photo by Shootingforthemoon-0813 via Dorkly. Photographer Sacha Goldberger's "Super Flemish" portraits.